Bioresorbable vascular scaffolds (BVS) have gained significant interest in both the technical and clinical communities as a possible alternative to metallic stents. For accurate BVS analysis, intravascular optical coherence tomography (IVOCT) is currently the most suitable imaging technique due to its high resolution and the translucency of polymeric BVS struts for near infrared light. However, given the large number of struts in an IVOCT pullback run, quantitative analysis is only feasible when struts are detected automatically. In this paper, we present an automated method to detect and measure BVS struts based on their black cores in IVOCT images. Validated using 3 baseline and 3 follow-up data sets, the method detected 93.7% of 4691 BVS struts correctly with 1.8% false positives. In total, the Dice’s coefficient for BVS strut areas was 0.84. It concludes that this method can detect BVS struts accurately and robustly for tissue coverage measurement, malapposition detection, strut distribution analysis or 3D scaffold reconstruction. A. Grüntzig, “Transluminal dilatation of coronary-artery stenosis,” Lancet 311(8058), 263 (1978). J. E. Sousa, P. W. Serruys, and M. A. Costa, “New frontiers in cardiology: drug-eluting stents: Part I,” Circulation 107(17), 2274–2279 (2003). B. Kalesan, T. Pilgrim, K. Heinimann, L. Räber, G. G. Stefanini, M. Valgimigli, B. R. da Costa, F. Mach, T. F. Lüscher, B. Meier, S. Windecker, and P. Jüni, “Comparison of drug-eluting stents with bare metal stents in patients with ST-segment elevation myocardial infarction,” Eur. Heart J. 33(8), 977–987 (2012). P. W. Serruys, A. T. Ong, J. J. Piek, F. J. Neumann, W. J. van der Giessen, M. Wiemer, A. Zeiher, E. Grube, J. Haase, L. Thuesen, C. Hamm, and P. C. Otto-Terlouw, “A randomized comparison of a durable polymer Everolimus-eluting stent with a bare metal coronary stent: The SPIRIT first trial,” EuroIntervention 1(1), 58–65 (2005). S. Brugaletta, H. M. Garcia-Garcia, Y. Onuma, and P. W. Serruys, “Everolimus-eluting ABSORB bioresorbable vascular scaffold: present and future perspectives,” Expert Rev. Med. Devices 9(4), 327–338 (2012). C. I. Stefanadis, “Stents for coronary artery disease: from covered to drug-eluting to bioabsorbable., ” Hellenic J. Cardiol. 53(1), 89–90 (2012). D. Dudek, Y. Onuma, J. A. Ormiston, L. Thuesen, K. Miquel-Hebert, and P. W. Serruys, “Four-year clinical follow-up of the ABSORB everolimus-eluting bioresorbable vascular scaffold in patients with de novo coronary artery disease: the ABSORB trial,” EuroIntervention 7(9), 1060–1061 (2012). J. Gomez-Lara, S. Brugaletta, R. Diletti, S. Garg, Y. Onuma, B. D. Gogas, R. J. van Geuns, C. Dorange, S. Veldhof, R. Rapoza, R. Whitbourn, S. Windecker, H. M. Garcia-Garcia, E. Regar, and P. W. Serruys, “A comparative assessment by optical coherence tomography of the performance of the first and second generation of the everolimus-eluting bioresorbable vascular scaffolds,” Eur. Heart J. 32(3), 294–304 (2011). 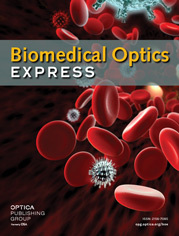 A. Karanasos, C. Simsek, P. Serruys, J. Ligthart, K. Witberg, R. J. van Geuns, G. Sianos, F. Zijlstra, and E. Regar, “Five-year optical coherence tomography follow-up of an everolimus-eluting bioresorbable vascular scaffold: changing the paradigm of coronary stenting?” Circulation 126(7), e89–e91 (2012). P. W. Serruys, J. A. Ormiston, Y. Onuma, E. Regar, N. Gonzalo, H. M. Garcia-Garcia, K. Nieman, N. Bruining, C. Dorange, K. Miquel-Hébert, S. Veldhof, M. Webster, L. Thuesen, and D. Dudek, “A bioabsorbable everolimus-eluting coronary stent system (ABSORB): 2-year outcomes and results from multiple imaging methods,” Lancet 373(9667), 897–910 (2009). P. W. Serruys, Y. Onuma, J. A. Ormiston, B. de Bruyne, E. Regar, D. Dudek, L. Thuesen, P. C. Smits, B. Chevalier, D. McClean, J. Koolen, S. Windecker, R. Whitbourn, I. Meredith, C. Dorange, S. Veldhof, K. Miquel-Hebert, R. Rapoza, and H. M. García-García, “Evaluation of the second generation of a bioresorbable everolimus drug-eluting vascular scaffold for treatment of de novo coronary artery stenosis: six-month clinical and imaging outcomes,” Circulation 122(22), 2301–2312 (2010). A. Sheehy, J. L. Gutiérrez-Chico, R. Diletti, J. P. Oberhauser, T. Glauser, J. Harrington, M. B. Kossuth, R. J. Rapoza, Y. Onuma, and P. W. Serruys, “In vivo characterisation of bioresorbable vascular scaffold strut interfaces using optical coherence tomography with Gaussian line spread function analysis,” EuroIntervention 7(10), 1227–1235 (2012). N. Gonzalo, P. W. Serruys, N. Piazza, and E. Regar, “Optical coherence tomography (OCT) in secondary revascularisation: stent and graft assessment,” EuroIntervention 5(Suppl D), D93–D100 (2009). J. L. Gutiérrez-Chico, M. D. Radu, R. Diletti, A. Sheehy, M. B. Kossuth, J. P. Oberhauser, T. Glauser, J. Harrington, R. J. Rapoza, Y. Onuma, and P. W. Serruys, “Spatial distribution and temporal evolution of scattering centers by optical coherence tomography in the poly(L-lactide) backbone of a bioresorbable vascular scaffold,” Circ. J. 76(2), 342–350 (2012). B. D. Gogas, V. Farooq, Y. Onuma, and P. W. Serruys, “The ABSORB bioresorbable vascular scaffold: an evolution or revolution in interventional cardiology?” Hellenic J. Cardiol. 53(4), 301–309 (2012). S. Gurmeric, G. G. Isguder, S. Carlier, and G. Unal, “A new 3-D automated computational method to evaluate in-stent neointimal hyperplasia in in-vivo intravascular optical coherence tomography pullbacks,” Med. Image Comput. Comput. Assist. Interv. 12(Pt 2), 776–785 (2009). G. Unal, S. Gurmeric, and S. G. Carlier, “Stent implant follow-up in intravascular optical coherence tomography images,” Int. J. Cardiovasc. Imaging 26(7), 809–816 (2010). C. Xu, J. M. Schmitt, T. Akasaka, T. Kubo, and K. Huang, “Automatic detection of stent struts with thick neointimal growth in intravascular optical coherence tomography image sequences,” Phys. Med. Biol. 56(20), 6665–6675 (2011). A. Wang, J. Eggermont, N. Dekker, H. M. Garcia-Garcia, R. Pawar, J. H. C. Reiber, and J. Dijkstra, “A robust automated method to detect stent struts in 3D intravascular optical coherence tomographic image sequences,” Proc. SPIE 8315, 83150L (2012). G. Unal, S. Bucher, S. Carlier, G. Slabaugh, T. Fang, and K. Tanaka, “Shape-driven segmentation of the arterial wall in intravascular ultrasound images,” IEEE Trans. Inf. Technol. Biomed. 12(3), 335–347 (2008). A. Wang, J. Eggermont, N. Dekker, H. M. Garcia-Garcia, R. Pawar, J. H. Reiber, and J. Dijkstra, “Automatic stent strut detection in intravascular optical coherence tomographic pullback runs,” Int. J. Cardiovasc. Imaging 29(1), 29–38 (2013). J. M. S. Prewitt, “Object enhancement and extraction,” in Picture Processing and Psychopictorics, B. S. Lipkin, ed. (Academic Press, New York, 1970), pp. 75–149. E. W. Dijkstra, “A note on two problems in connexion with graphs,” Numer. Math. 1(1), 269–271 (1959). W. K. Pratt, Digital Image Processing (John Wiley & Sons, Inc., 1978), p. 750. A. Wang, J. Eggermont, N. Dekker, P. J. de Koning, J. H. Reiber, and J. Dijkstra, “3D assessment of stent cell size and side branch access in intravascular optical coherence tomographic pullback runs,” Comput. Med. Imaging Graph. 38(2), 113–122 (2014). van der Giessen, W. J. Fig. 1 A baseline IVOCT image in (a) the Cartesian coordinate system and (b) the polar coordinate system. In both images, the imaging catheter (IC), the protective sheath (PS), the guide wire, a micro vessel and a BVS strut are marked. Fig. 2 The flow chart of the BVS strut detection method. Fig. 3 The detected imaging catheter (dashed straight line “1”), protective sheath (solid curve “2”) and guide wire shadow region (area “3”) are given in figure (a). The masked image is given in figure (b). Inside the protective sheath, it is masked with the background intensity value, while the guide wire shadow region is masked as 0. Fig. 4 The gradient images of a baseline image and a follow-up image are given in figures (a) and (b). They are used for lumen detection. Yellow curves indicate the detected minimal cost paths. In figures (c) and (d), the original polar images are presented with lumen contours (white curves). The new polar images transformed based on the lumen center are shown in figures (e) and (f) in which most of the BVS struts are more rectangular than in original polar images. Fig. 5 Figures (a) and (b) show a scan-line (white line) passing through a BVS strut in a baseline image and a follow up image, respectively. The corresponding gradient images are presented in figures (c) and (d). The intensity profile (yellow curve) and the gradient profile (white curve) are given in figures (e) and (f). A BVS strut always has low intensity values in the black core region and strong gradient values along the boundary. Fig. 6 Figure (a) shows a new polar baseline image that is transformed based on the center of a highly irregular lumen contour. The BVS struts in figure (a) still appear distorted and their thickness in the vertical direction is very different. Figure (b) demonstrates a follow-up image transformed based on the center of a circular lumen contour. The BVS struts are less distorted than these in figure (a). The detected candidate line segments (short white lines) are presented in both figures (c) and (d). Both white and black arrows point out the candidate segments caused by residual blood or noise in tissue. These candidates will be clustered as false candidate strut during the clustering. After the false positive removal, only real struts are left as figures (e) and (f) shows. Fig. 7 The original boundaries of clusters formed by white points in figure (a) and the smoothed boundaries in figure (b). Fig. 8 Figure (a) shows the smoothed boundaries of a cluster in yellow dots. In figure (b), two white lines are fitted to the top part of the strut boundary and two light blue lines are fitted to the bottom part of the strut boundary. Along the fitted lines, the missed boundaries in the sharp tip regions are recovered as figure (c) demonstrated and the final refined strut contour is generated as (d) presents. Fig. 9 Figure (a) shows two black cores marked by the first observer and they were marked as a big strut by the second observer as figure (b) presents. A comparison of the ground truth (solid white contours) from the second observer and the algorithmic results (dashed yellow contour with white translucent mask) in a baseline image is presented in figure (c) and another comparison of the ground truth from the first observer and the algorithmic results in a follow-up image is given in figure (d). The enlarged images of the white rectangle regions are given in figures (e) and (f).